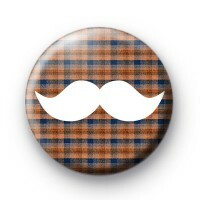 White Moustache pin badge on a fun orange and blue plaid pattern. It looks like a countryside tweed pattern! These badges are always popular and great for your fundraising efforts for Movember & Stag Parties too. We have a great selection of Moustache badges so be sure to check out all our other fun designs. If you are a facial hair aficionado, these bright, bold tash badges will be perfect. All our badges are the standard 25mm size and made from metal and plastic with a copper pin.